This recipe has a special story for me. First off, I had been using this pumpkin dip for a few years, it tastes like pumpkin pie, but better, because it has cream cheese inside. This dip goes well with ginger snaps, apples, and anything else you want to dunk in here. I had been making this combination for a few years, and brought it to my office holiday party. It won the baking contest for cookies. Honestly, it is the first baking contest I ever won. Thanks to Sharon for sharing this recipe, and the ginger snap cookies are my personal favorite recipe adapted from the Joy of Cooking cookbook. 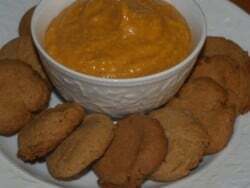 Quick and easy pumpkin pie dip tastes so good with Gingersnap cookies. Grease cookie sheets before use. Combine flour, baking powder, baking soda, salt, ginger, cinnamon, and cloves in a large bowl and mix until very fluffy. In a different bowl cream together butter and sugar until well combined. Add to the butter and sugar mixture the eggs, molasses, lemon extract. Stir in the flour mixture until blended. Form the dough into 3/4 inch balls and arrange about 1 1/2 inches apart. These cookies do not spread much when baking. Bake 1 sheet at a time for about 12 minutes. The cookies will flatten and develop a crinkled surface as they bake. Let stand briefly and remove to a rack to cool. Sharon's Pumpkin Dip 1 14 ounce can pumpkin 8 ounces soft cream cheese 1 cup confectioners sugar 1 tablespoon pumpkin pie spice Use a wire whisk to mix together a 14 ounce can of pumpkin, 8 ounces of really soft cream cheese, a cup of confectioners sugar, and a tablespoon of pumpkin pie spice. If you don't have pumpkin pie spice in your pantry, substitute 1 1/2 tsp cinnamon and 1/4 teaspoon each of ground nutmeg, ground ginger and ground clove. Thank you for posting this!! This is one of my fave fall recipes and I lost it!! I am so excited!! It is so yummy!!! My two favorites together- too bad I gave up sugar or I’d be all over these! i did put a bookmark on this site because of those recipes but i need to say that i love to see so much creativity in the kitchen. Well done … love to come back and see what will be new to try. hmm yummi.. nice recipe.. thanx 4 share.. Thanks for entering Gourmet Girl Magazine’s Virtual Holiday Cookie Crawl. I love the dip, sounds delightful.